Along with the pure build of Android, the smartphone comes with relatively top-of-the-line internals, a premium all-metal design, a dual-camera setup at the rear and some nifty features like Dolby ATMOS and splash resistance. All that for just Rs 12,999. On paper that sound pretty enticing. But does the K8 Note have what it takes to stand tall against some seriously heavyweight competition like the Xiaomi Redmi Note 4, Moto G5 Plus and the Nokia 6? On paper, Lenovo has checked all the right boxes but does that translate to a superlative user experience? Are the dual cameras worth it or just a gimmick? Let's find out. The Lenovo K8 note is crafted entirely out of series 5000 aluminum and looks quite sleek and premium, especially in the sublime Venom Black colour, which comes with a matte finish at the back. Unlike in the Moto G5 Plus and many other handsets in this price range, there is no trace of plastic to be found on the K8 Note. While the design will not win any awards for originality and looks a tad generic from certain angles, it is quite elegant and classy. There are no gaudy finishes to be found here -- everything is very tastefully done. What might put some people off though is the fact that the smartphone is a bit too wide, which along with the substantial top and bottom bezels make it a bit cumbersome to use with one hand. The all-glass front is covered by 2.5D Gorilla Glass which enhances the in-hand feel and also protects against nicks and scratches. At the rear, the overall look is very clean with a subtle Lenovo logo in the lower half of the back panel and a vertically mounted dual camera setup and fingerprint sensor at the top. The smartphone comes with three separate slots for your microSD card and two SIM cards -- no Hybrid SIM funny business going on here. The K8 Note also comes with a dedicated Music Key on the right edge which can be used to control music playback as well as reconfigured to turn on the flashlight or open any third party application. While brownie points must be given to Lenovo for not going the Samsung way and making the key locked to a specific function (Bixby button), the implementation of the Music Key is a bit lacking. Currently, the key does absolutely nothing at all on a single press. You have to long press it to play/pause (which can also be reconfigured ), double click it to skip a track and triple click it to go to the previous track. The ideal implementation would have been -- single press to play/pause and leave long press as a customisable function. This is something obviously done with software so chances are that Lenovo may fix it in future, depending on user feedback. All in all, in a day and age of smartphones sporting loud and over the top designs in a bid to stand out from the crowd, the K8 Note looks suave and classy, especially in the Venom Black color. The Lenovo K8 Note comes with a 5.5-inch fullHD IPS LCD display, which is fairly decent for the price. The colours are nice and punchy, viewing angles are on point and it's nice to see Lenovo not skimp out and equip the K8 Note with a 720p panel. Even though Lenovo claims the display has 450 Nits of brightness, I found the maximum brightness lacking. As a result, the sunlight legibility of the display too is not that great. During indoor use, however, the screen is fairly good. As the K8 Note is a multimedia focused smartphone, it comes with a few tricks up its sleeve like Dolby ATMOS (available only with wired headphones) and Theatre MAX 2.0. While Dolby ATMOS does provide a nice surround sound effect, audio purists may find it a tad artificial and synthetic. Theatre MAX 2.0 is actually pretty cool -- it basically splits the screen into two halves and makes it look like you are watching content on a large theatre like screen (when viewed through a VR headset). The most talked about feature of the Lenovo K8 Note is the fact that the smartphone runs a near stock build of Android 7.1.1 Nougat out of the box. After years of equipping their smartphones with a heavily skinned and bloat-ridden version of Android in the form of Vibe UI, this is a refreshing and much needed change from Lenovo. In day to day use, the K8 Note feels like someone has crammed Motorola's software inside a Lenovo smartphone, which is not that surprising given the fact that Lenovo and Moto brands are owned by same company. Apart from Moto's suite of applications and their trademark gestures like karate chop to turn on the flashlight, the software on the K8 Note is exactly the same as that you will find on a current generation Motorola smartphone. Even Moto's custom icons and their trademark clock widget are present on the K8 Note. Stock Android does make a difference in day to day to use. Paired with the fairly powerful internals, the smartphone is zippy and strums along nicely without any major lags and slowdowns. It is surely an improvement over Vibe UI and a step in the right direction for Lenovo. However, I did witness some bugs and app crashes throughout my 8-plus days of usage. Bugs included the Wi-Fi getting disconnected arbitrarily, the settings pane freezing up and so on. Also, in a move very uncharacteristic of stock Android -- Lenovo has bundled an app called Protect which keeps on sending annoying notifications that cannot be dismissed. Lenovo's own Help app also commits that same sin. These small, but significant, niggles take away from the soul of stock Android which is supposed to be a irritation and bloat-free free affair. Whether the K8 Note will receive Android updates in a timely manner is a question that can only be answered with time. The previous record of Lenovo has not been great on this account. But this time Lenovo is making some commitment to provide better updates. A Lenovo representative did tell me that the K8 Note will be updated to Android O but the proof of the pudding will be in eating it. Lenovo does claim that the move to a common software platform (stock Android) will help them provide better support and efficient updates. So hopefully the K8 Note will buck the trend and receive updates on time. 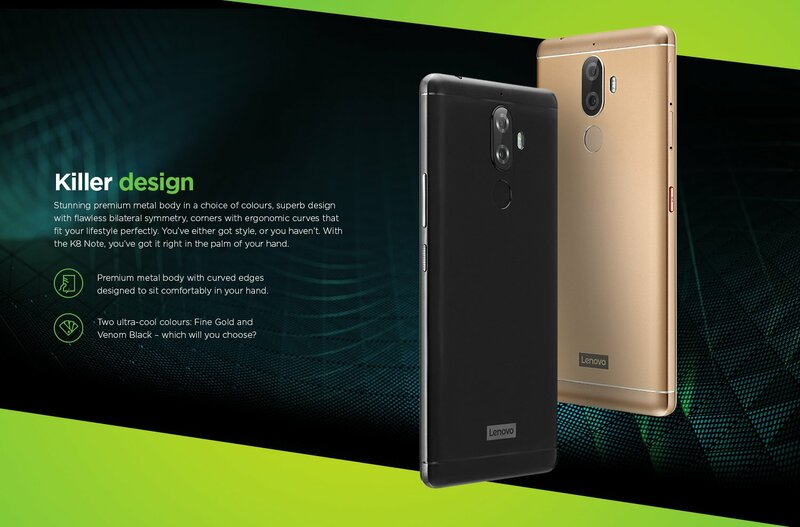 The K8 Note is powered by the deca-core Helio X23 processor paired with 3/4GB of RAM and the Mali T880 GPU. The smartphone comes with 32/64 GB of internal storage which can be expanded via a microSD card (of up to128GB). On paper, the smartphone comes off as a specification monster. A 10-core processor for Rs 12,999? Well, reality is a bit more complicated than that. The smartphone is quite fast -- make no bones about that. The K8 Note is not a slow or sluggish phone by any stretch of the imagination. However, it is not faster or better in any way than other handsets running on technically "slower" Snapdragon 625 chipsets out there. The K8 Note performs quite well in day to day tasks like web browsing, using social media apps, taking occasional pictures and so on but does not blitz through them like its benchmark numbers suggest -- there is the occasional lag or stutter that peeps in every now and then. When pushed, the smartphone performs admirably enough, though some minor lag is evident. Where the K8 Note disappoints is when it come to heat dissipation -- it heats even with moderate use. Gaming performance is great though. The device handles intensive titles like Asphalt 8 and Modern Combat 5 fairly well without any frame rate drops to speak of. As expected, casual games like Subway Surfers and Candy Crush Saga are handled with aplomb. Powering the K8 Note is a 4,000mAh battery, which the company claims is good for one full day of intensive use. I got quite inconsistent results from the K8 Note in terms of battery life. There were days when the smartphone died on me before I even reached home from work (between 7pm- 8pm). On the other hand, there were days when the smartphone lasted me till the night ( 12-1 AM). Whatever the case, one thing is for sure, you will not get more than one day of use out of the Lenovo K8 Note, even with moderate use. This is decent battery life, but nothing more. In other words, it will be prudent to charge the phone at least once more in evening when you get time. In old days, this would have been good enough battery life. But nowadays we have phones that easily offer more than a day's battery life. Sadly, the K8 Note is not one of them. The K8 Note is the first smartphone from Lenovo to come with a dual camera setup at the back. There is a 13MP primary Pure Cel sensor mated to a secondary 5MP sensor. Both have an aperture of f/2.0 and allow for the capture of images with depth of field effects. While the primary camera is above average and produces images with fair amount of detail and dynamic range in well-lit scenarios, the secondary sensor is sub-standard. In the 'Depth Enabled' mode, the camera really struggles to capture focus and the bokeh effect and the resultant images looks artificial and slightly tacked on. There is a lot of blurring and loss of detail around the edges of the subject whilst taking a bokeh shot, especially in the highest f/1.2 setting. At lower settings, the bokeh effect looks decent, but not spectacular. Now, some of this blurring and focus issues are natural because when a very wide aperture (such as F1.2 or F1.4) is used these issues crop up even in proper high-end DSLR cameras. But given the fact that this phone is meant for regular users, who may not be aware of how apertures work, Lenovo should have got the software right. It is also possible that in future updates Lenovo will fix this. May be they can remove the F1.2 portrait mode setting, so that users don't use it and expect to get razor sharp images. Or maybe they can fine tune the software in some other way. But currently the portrait mode is somewhat unusable. The primary camera is a much better proposition. It produces good images in well lit scenarios. The shots have natural colors, good, dynamic range and are well exposed. In low-light, while the images are not as good as the Moto G5 Plus, they are quite respectable and not muddy. Noise is also controlled. Unlike the dual camera implementation found on smartphones such as the Honor 6X, where the secondary camera helps capture better low light shots, the secondary sensor on the K8 Note provides no benefit in the daily 'Normal' mode. On the front, there is a 13MP sensor with an aperture of f/2.2 which produces decent shots in well lit scenarios with natural colours and good detail but struggles in low light. The front sensor also has a single-LED flash which Lenovo calls 'Party Flash' which should help attract selfie fans. Should you buy the K8 Note? However, the bugs, heating, imperfect portrait mode and average battery life let it down somewhat. The mid-range is a very cut throat segment which has a lot of competition. With the K8 Note, Lenovo has done enough to earn a place in this high-stakes arena. But to stand on the top of the heap, the company will have to do more. If fast performance, stock Android and great build quality are your thing, the K8 Note will make for an attractive proposition. Also, the Rs 12,999 variant offers good value for money. That is the variant you should buy. However, if are considering the Rs 13,999 model, the Moto G5 Plus offers quite a better overall experience for just a little more money.